Translucent Liquid Sculpey is a bakeable liquid polymer medium. That means that it shares many of the same properties as solid polymer clay but has a number of characteristics that offer unique and unexpected possibilities. TLS opens a whole new arena for artists and crafters alike! It is a “bake-able” transfer medium for the new millennium! When artist’s oil paints are mixed with it, it can be an enamel, a glaze, or a backfilling compound. When pigments or mica powders are mixed with it, it can be a stipple, a metallic glaze, or a grout for polymer clay mosaics. TLS is also a fantastic transfer medium. It is a terrific adhesive agent. Its adhesive qualities are activated only after baking. It increases the clay to clay bond between raw layers of clay, and when adding raw layers to previously baked layers. 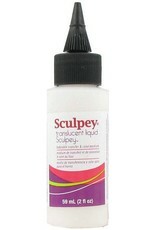 Translucent Liquid Sculpey is available in a 2 oz bottle.